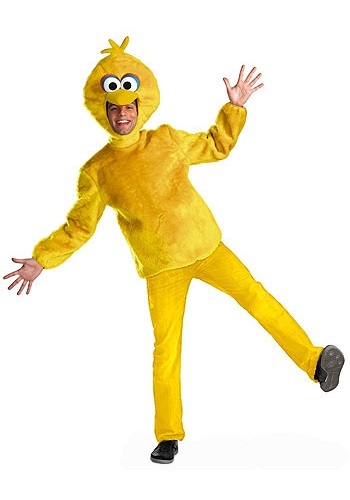 Bring this childhood favorite to life with our Big Bird costume! The long-sleeved shirt is 100% polyester interlock knit and faux fur, with elastic at the sleeve cuffs and Velcro tabs at the back of the neck. The shirt back is interlock, the front & sleeves are faux fur. The faux fur headpiece has an inner hood of yellow interlock, and Big Bird's beak and eyes soft-sculpted of felt above the face opening in the character mouth. The hood fastens under the chin with Velcro. Be sure to check out all of our Sesame Street characters.